Previously, Mr. Brand served as the Chief Financial Officer of BeyondSpring (NASDAQ: BYSI). He was Chairman and Chief Executive Officer of Point Capital, a consultant of the Whalehaven Group of Funds and a registered representative with Andrews Securities where his responsibilities included acting as dealer manager for Keating Capital. Mr. Brand also served as Managing Director of Caisse des Dépôts Securities and FleetBoston Robertson Stephens. As a banker and private equity professional, he structured debt financings for a number of oil and gas companies. Mr. Brand is a member of the Global Association of Risk Professionals. He is the Series 7 – General Securities Representative and the Series 63 – Uniform Securities Agent State Law Examination Securities Representative. He received his MBA in Finance from University of Chicago and his BA in Economics and English from University of Iowa (Phi Beta Kappa). Dr. Van Etten is also the Director of the Chao Family Comprehensive Cancer Center at UCI. He was previously the Director of the Tufts Cancer Center and Chief of the Tufts Hematology and Oncology Division. Dr. Van Etten is the recipient of the Zucker Family Research Prize and the Lucille P. Markey Scholar Award. He is also a Carl and Margaret Walter Scholar and has published over 90 published peer reviewed papers. Dr. Van Etten is a member of the American Associate for Advancement of Sciences, American Society of Hematology, American Society of Clinical Oncology and the Eastern Cooperative Oncology Group. He is a contributing Editor to UpToDate, and on the editorial board of the Journal of Clinical Oncology. Neal Howard: Welcome to Health Professional Radio. I’m your host Neal Howard, thank you for joining us once again. I’ve got two guests in studio with me right now, Mr. Richard Brand, the Chief Financial Officer of the Laboratory for Advanced Medicine or LAM and Dr. Rick Van Etten, he’s Chief Medical Officer for LAM and they’re joining us here on the program to talk about IvyGene. It’s a highly accurate blood test and we’re going to talk about this blood test that’s going to be instrumental, I’m sure in detecting early stage cancer. Welcome to the program both Richard Brand and Dr. Van Etten. Dr. Richard Van Etten: We’re glad to be here. Richard: Well prior to joining LAM, I was CFO for another biotech company and over the course of a two-year span, we ended up going public and becoming the best performing biotech IPO for much of 2017. With liberalisations in China announced late in October of 2017, the company’s pretty much returned there and that opened me up for an opportunity to join LAM. Most of my business in the past was helping as a CFO and as an investment manager for other people and then before that, in capital markets and investment banking. Neal: And Dr. Van Etten, what is your area of expertise? Dr Van Etten: Well I’m a hematologist oncologist. I specialize in blood cancer and I’m currently the Director of the NCI designated Cancer Center at the University of California Irvine. Neal: What is the Laboratory for Advanced Medicine? I mean it sounds like it’s a very broad range of activities that your company can be involved in, what is LAM? Richard: Yeah, well actually the name describes our vision but to be successful at this stage of our company, we need to be focused and our focus is bringing to help people a number of tests to detect cancer with high accuracy and do so from a blood sample. So we are launching a liver cancer detection test and also in the lab in the last half of last year we discovered markers for other types of specific cancers that we can detect with high accuracy. Neal: So we’re talking what is commonly referred to as early stage or are we talking about even earlier than that? Dr Van Etten: Yes. 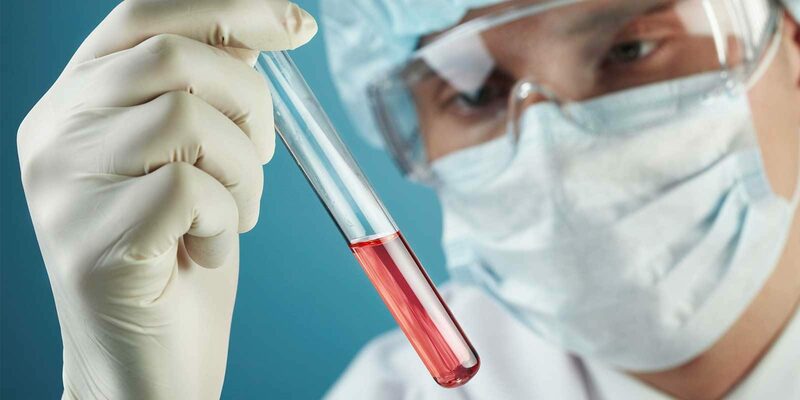 The products that LAM is developing are primarily in the space for early cancer detection using blood tests so it’s commonly referred to as for instance as a liquid biopsy. Neal: What makes a liquid biopsy better at early detection? I know it’s kind of maybe an obvious question but explain it to our listeners why it’s so revolutionary. Richard: I think the analogy is that we’re not safe photography-based like other approaches, ultrasound or mammography for breast cancer. And as a result, they do better when the tumor is larger and stage 3 but what we found and the science supports is that the type of marker we’re detecting in the blood is at elevated levels in our bodies even at the beginning of a tumor and that allows us to have high accuracy even at stage one cancer detection. Neal: So obviously detecting it much earlier greatly reduces the impact of the treatment as opposed to catching it in second or third stage obviously. Or does that make a big difference? I mean getting rid of it even though it’s detected that early. Is it the same process, the same procedure? Dr Van Etten: Yes, the majority of cancers are cured surgically, surgical incision and there’s a very strong correlation with the ability to cure cancer based upon the stage so the earlier you catch it, more likely it is to be cured by surgery alone. Neal: Now we’re talking cured, not simply going into remission so that the same cancer can recur in the same place or someplace else, right? Dr Van Etten: Well that’s correct. Let’s take early-stage breast cancer, so a woman today would have mammography which is a test that has sufferers form some problems with sensitivity which is the ability to detect these early cancers particularly in denser fibers … If you detect the lesion, you have a biopsy then you excise the mass and the idea is that that will be curative. Some women will need additional therapy which is called adjuvant chemotherapy and that’s to prevent the development of metastases by eliminating small … of cancer that is already spread at the time of diagnosis. But again the earlier the stage, the more likely it is that we can cure it by surgery and you can catch it before it is spread. Neal: Now I believe it was Richard who pointed out that you need to be focused as an enterprise. IvyGene, is this one of these tests that diagnoses liver, breast, colon, lung – all of the cancers – or is it focused on a couple of specific types? Richard: We have a test commercially available that I would call like a version 1.0 and it’s a panel in the sense that it detects that a patient has cancer and does so with high degrees of accuracy but it’s not geared yet to detect what the tissue … is so it would tell the general practitioner that the patient has a cancer. It might be low liver, it might be lung, it might be breast cancer but it’s just a good early warning signal for the doctor and the patient that more tests have to be run on that patient because that patient does have cancer and that is finding commercial success already with at-risk patient populations such as firefighters. We know after 9/11 that firefighters have an increased risk of lung cancer and are getting one cancer at earlier stages so we have municipalities around the country who are buying our service to test their employees, the firefighters. And we’re also finding other specialist medical practices who are finding this as a beneficial test. But as we progress with our success in the lab, our greater focus will be on these cancer specific tests that we have. The first one being liver and then eventually what we want to do is have a number of those, eight or ten or twelve that we can bundle up and then have a much more robust panel test in the future which would tell the practitioner that the patient has cancer and also the … of that cancer. Neal: Describe a conversation with a patient between a patient and practitioner where the decision is made to employ IvyGene. What are some of the symptoms, some of the outcomes, some of the things before you decide that this blood test is the way to go? Dr Van Etten: Well it would depend on exactly what the test was and what type of cancer it is and the pan-cancer test as Richard mentioned is currently a laboratory developed test that’s available, it can be ordered. And its principal market right now has been in screening and first responders but perhaps we could focus on our first product that is undergoing clinical trials right now which is for early detection of liver. So in that case, there’s a population that’s well-defined who is at high risk for liver cancer and those are people that have cirrhosis damage to the liver through several different causes including alcohol, drugs, viruses, some hereditary conditions, conditions like that. So these folks are at high risk for liver cancer than the general population. They will go on to development, liver cancer at a frequency between 1 and 15 percent per year and currently they’re screened by ultrasound and the IvyGene liver test is a very sensitive and specific test test that is designed to detect those cancers without needing an ultrasound and it is intended to be used every year just like ultrasound screenings so that’s the clinical trial that is underway right now, it to compare that to ultrasound. Neal: Well where can our listeners go online and get some more information about IvyGene and about LAM in general? Neal: Lamoncogroup.com, great. And we’ll find all the information that we that we need about the IvyGene and any of the other products or developments that you’re involved in as well, yeah? Neal: Alright. Well I thank you both for joining us on the program this morning, it’s been a pleasure and I’m hoping to hear more about LAM in the future. Richard: Thank you Neal, we appreciate it. Dr Van Etten: You’re quite welcome.